Code Blocks is very light weight, extensible and fully configurable C/C++ IDE. You can download code blocks from here. This post focuses on installation and configuration of code blocks on Ubuntu. Download the binary package codeblocks_8.02-0ubuntu1.deb.tar.gz. Inside the compressed file there is a folder with following packages. Install the packages in bold letters. In case you are wondering how to install, just double click on the packages (damn it’s easy to install softwares in Ubuntu 😛 ) After the installing you can access code blocks from menu Applications -> Programming -> Code::Blocks IDE. Click on Create a new project in home window to create your new project. Code blocks automatically adds an AVR Project option. Select that and click next. Fill the required informations like project name, path, crystal frequency etc and click finish. # Make sure to switch to Release mode to generate hex file. Do all the debugging in debug mode and once it’s done switch to Release mode and build again to generate hex file. Project hex file is in <Project dir>/<bin>/<Release> and it’s the .elf.hex file you need. Open the “User defined tools” window from menu: Tools -> configure tools. Click on Add button to open Edit tool window. Setting up a development environment for AVR microcontrollers in Ubuntu is very easy. Although for a new user it can be a time consuming task. I’ve recently setup the environment for my lab and I’m gonna just document it for future reference. Apart from the command line environment I’ve installed and configured Code Blocks, a very nice IDE, for building the project and I’ve also configured avrdude ( programmer for avr microcontrollers ) in Code Blocks. So now it’s no less than any other IDE. With this configuration it’ll be easy for coders who are used to a windows environment. Click here for code blocks installation and configuration. Next step is configuring the make file for your project. so open the make file and modify it as described below. You need to modify following parameters for your project. I’m assuming that The microcontroller is ATmega32 and programmers hardware is STK200. 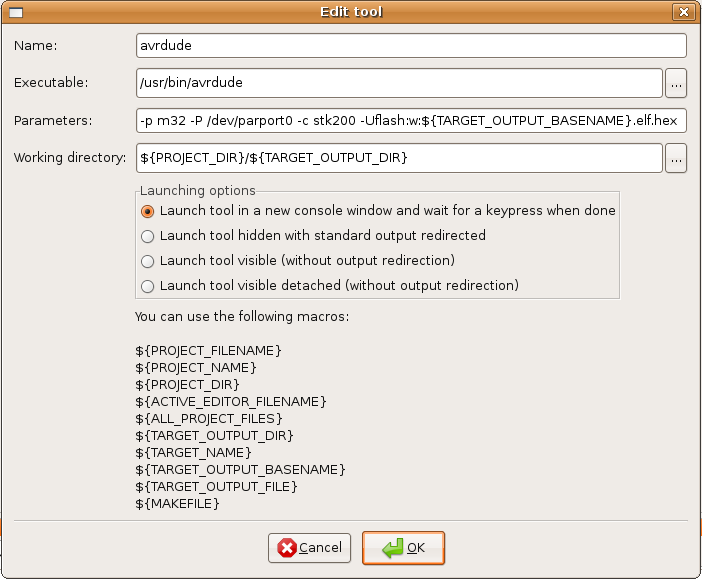 The parameters are divided in two groups , one is target specific and other is programmer (avrdude) specific. # (NOT .s !!!) for assembly source code files. # described in the avrdude info page. Save the file and you are ready. Go to the directory containing test.c and modified Make file and execute these commands. if everything goes right test.c will turn PORTD high. Leave me a message if you having problems. The reason for grub error 15 is very simple and so is the solution. The error gives you a message “Error 15: File not found!” simply because the file grub wants is not there. why? because grub is looking into a wrong device. You need to make changes to your /boot/grub/menu.lst file to fix the problem so that grub looks into the correct device but first find out where is your root partition.Boot from a live CD -> open terminal . For Ubuntu users it’ll be (hd0,5) and /dev/sda6 .Make sure the root device is correct in this file. Once everything is in place reboot the system. Congratulations you ‘ve just solved your grub problem. Grub error 17 and Grub error 15, the most common grub error messages. Grub error 17 is kind of scary because you don’t even see your grub menu in this case and grub error 15 is very frustrating because it shows the grub menu but comes back to same error over and over again. I was also terrified of these error because once you get these error you can’t use your system, you can’t access the net and that’s is just not cool.is it ? I ‘ve a perfectly good system. I ‘ve added this line in bold at the end to show how it’ll look like if your partition table disk order is messed up. To fix the disk order. Please note it’s hda not hda1 or hda3. No numbers we are working on entire disk. It’ll take you to fdisk prompt. Be careful here. choose option x (extra functionality (experts only)) and enter. then select f (fix partition order) and enter. then select option w (write table to disk and exit), and enter. X F W in short. Don’t do anything else unless you know what you are doing. Now you need to install grub. It’s very simple. The grub will be installed on /dev/hda6 which is written as (hd0,5) in grub. Make sure you understand this if it’s /dev/hda1 then you ‘ll use (hd0,0). It’s always one digit less in (hdX,Y). For Ubuntu users it’ll be (hd0,5) and /dev/sda6. Make sure the root device is correct in this file. /etc/apache2/sites-enabled :: Keeps soft links of hosted sites. Let’s assume our user name is saumya. The document root for apache by default is /var/www/. You need to change this. This will create a directory for user saumya (/home/saumya/public_html). This is the root directory for her website. We need to change the default document root. Edit the new configuration file saumya. In the file replace /var/www/ with /home/saumya/public_html . Now enable the new site configuration. $ sudo a2dissite default // disables the default configuration. save it and open web browser and type http://localhost . If it shows up in the browser everything is working fine. Restart the server and it’s all done. Now you can access your website with your IP. Setting up cgi-bin is very easy. Make a directory cgi-bin in document root. Open your the configuration file sites-available folder. In our case it’s saumya. and add these lines in between <Virtualhost > tags. Well Now you ‘ve configured your website completely. This configuration is good for hosting you website on LAN like university campus. If you really want to host your website on Internet you need to learn a lot about securing apache. Let’s leave that for some other day. A Friend of mine needed help with the websites they are designing and he asked me for help. The first thing i needed was a webserver with php, python and mysql server. I ‘ve installed web server in Linux many times but i haven’t really learnt it. Everytime I need to search for steps/guidelines on Internet. So I’m just gonna make a walk through for installing web-server in Linux. There are mainly 4 things you need for a fairly good web server. Apache web server with PHP and Python support and a MySQL server for database. We ‘ll be installing everything one by one. Installing PHP support for your web server. After installing php you need to restart your server. To test if the php is working with your webserver. insert <?php phpinfo(); ?> in the file testphp.php. Open your browser and type http://localhost/testphp.php . If a page opens displaying the php info then you did it :). Python and perl are scripting languages. If you don’t wanna do all this you can use tasksel and choose the task Web Server. It ‘ll install Apache, php, python and peron your system. Tasksel is the easy way. Now we are gonna install MySQL server. MySQL server is almost useless without php. Although you can use other languages like Ruby. So installing php-mysql to make MySQL available to PHP. You can access your mysql server from command line or from php but handle the database in much better ans easy way you need to install phpmyadmin. It’s a awesome tool for administering MySQl over web. Well now you have installed a very feature rich web server on your system. Check my other post on configuring web server for all the configuration details. Installing this in ubuntu is very easy. All the packages are bundled together in a task LAMP (Linux Apache MySQL PHP). So for installing web server in ubuntu. It’ll show you all the tasks. (See my earlier post on tasksel for details info on tasksel.). Select LAMP by pressing space bar and just OK it. Fully featured web server will be installed in your system. This should fix the problem. You need to reboot after this step. Sometimes this also doesn’t work. For such situations you should keep a copy of Hiren’s Boot CD or System rescue CD these live CDs are rescue CDs and contains chkdsk tool, comes really handy in times like this. NTLDR missing is one error message that scares most windows users to death. Usual thought is that system is gone. It’s a very simple error and can be fixed very easily. NTLDR (NT Loder ) is the boot loader for windows just like grub or lilo in Linux. NTLDR missing error doesn’t mean that your system is gone it simply tells you that bootloder is missing or corrupted. Here is what you can do to correct this. You ‘ll need a bootable windows CD. At the Welcome to Setup screen , press R to start recovery console. Type the number corresponding to the Windows installation you wish to repair (usually 1, if you have only one installed copy) and press Enter. When prompted, type the administrator password and press Enter. Remove the Windows XP CD from the drive and restart the computer. That’s all. Everything is fixed and the way it was before. Things get complicated when you don’t ‘ve any recovery disk. You can simply copy these files from another computer which has same setup and OS as yours to C drive. Using Linux live CD is the easiest method. Copy the file ntldr and NTDETECT.COM to USB drive. Mount your C drive and copy these files to C drive. How to mount windows drives in ubuntu is still a major issue for new user. I’ve written a script to auto mount drives at startup. No need for you to go change fstab and get confused 🙂 . Ubuntu has made mounting drives very easy. You just need to click on the drive and it’s mounted 🙂 pretty easy huh. I bet windows fans coming to Linux would love it. Despite all this sometime you might need to mount manually. FAT32 drives mount flawlessly all the time but NTFS drives gives error if it’s a dual boot machine which powered off or reboot to Linux in the middle of either windows start up or windows shutdown. Couple of things you need to know when you mount manually on ubuntu. There is default mount folder in ubuntu /media. /mnt is another one usually used for manual mounting. There is not rule about using /mnt only for manual mount you can mount anywhere. Make a folder /win_drives or /home/user/win_drives anywhere you want you can mount. The catch here is with the nice click mount/umount utility provided by ubuntu. If you mount a drive manually it can be unmounted only manually. If you mount your drives anywhere other than /media like in /mnt or /win_drives it won’t show up in places column in file manager. Although it show up in places if your mount point is in your home directory. Windows Vs Linux seems like a never ending debate. I prefer Linux but I do use windows for playing games. Although now with Crossover office it’s possible to play PC games on Linux. So now Linux is getting better and better. I always ask my friends to switch to Linux and use open source softwares but they are too much of windows fan and stupid. I mean one of ’em don’t even mind virus as long as everything is done peacefully with double click. That’s his arguments that in windows you can do everything by just double click where as in Linux you need use shell and you need to remember commands and seems like too much work. There was a time when it was true. Most of the task required the use of CLI (Command Line Interface) but now things have changed. With Ubuntu and Gnome the desktop is more user friendly than ever but people are still reluctant to use it. The most important feature of Linux, security, is often overlooked because of a slight confusing desktop. A new user don’t see the security features of Linux right away what he really sees is how it looks. Earlier it looked kind of dry but today with Compiz nothing can even come close to possibilities the way we cam tweak our desktop. To me this looks very similar to the time when computer came and started to take over typewriters. Using a typewriter was very easy Put the paper in and go ahead. Nothing can be easier than this. Then slowly computers starts to replace typewriters. There must have been challenges to educate people with the concepts of files, directories, saving, moving . copying , where exactly the file is inside the system. What a shame we need a external printer to print. It is so hard. How do you connect computer and printer. There are so many wires. Come on ….. This is way to much work. I’m gonna stick to my typewriter. But then computers + printers started to print multiple copies in minutes it caught everybody attention. No need to type again and again. No need to keep track of fat files biting dust on old shelves. Magical things were happening and slowly people realized the importance of computer and look at ’em now. A five year old could computer like a toy. Windows Vs Linux is quite similar to Typewriter Vs Computer but in software domain. There are unimaginable things you can do in Linux, something windows can’t even dream of. In the present world the most important thing is securing your data. Why do you think government organizations mostly use Unix/Linux ( because it’s free and they don’t wanna spend funds 😛 )? Linux is a blessing for education, embedded sector, computing, it’s everywhere. People are just started to get to know it and I’m very sure someday It’s gonna replace windows completely. It is similar to the computer( + Internet) which has changed our life. The same thing is happening again with Linux ( + Open source) and it’s gonna change the world again. A world with freedom. A world with Quality tested softwares by millions of users. A world of sharing which will bring true harmony to the world.